Karela Bitter Gourd “Margose” is one of my very favourite bitter vegetables. I have always loved this vegetable/fruit since I was little. I love it any kind of dishes whether stir fried, curried, vindaye spices. Bitter gourd or Karela may not be the favourite of many people because of its bitter taste. However over centuries this fruit /vegetable have been one of the main ingredients in many medicinal recipes and therapeutic treatments. It is packed with some key nutrients and healthy components, making it a very healthy addition to your diet. The secret of all its good properties lies in the bitterness; it is loaded with medicinal values. Cut the Karela in half, using a spoon scrape out the seeds. Cut in strip, it’s entirely your choice how thick or thin you wish to cut the Karela. Season with salt and leave either overnight or for at least one hour. This helps to reduce the bitter taste in the vegetable. By adding the salt and leaving the Karela to marinate also start the pickling process. Remove the Karela and drain in a colander, to get rid of excess water which would have collected during the salting process. Squeeze all the excess water out. 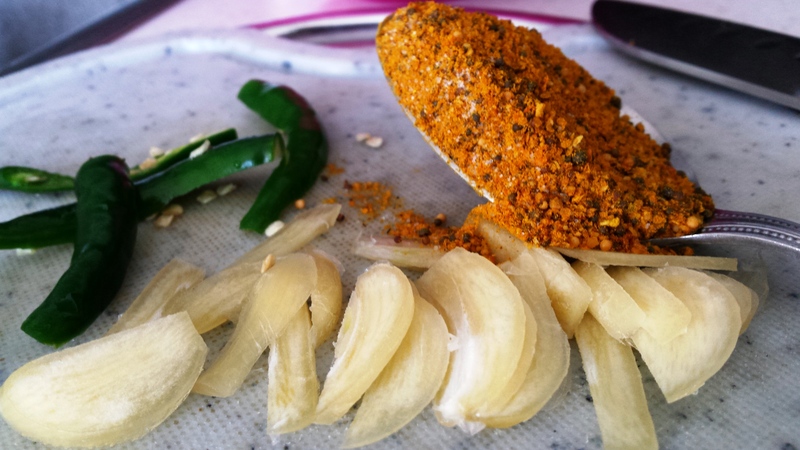 Heat the oil in a large frying pan, add the drained sliced Karela. 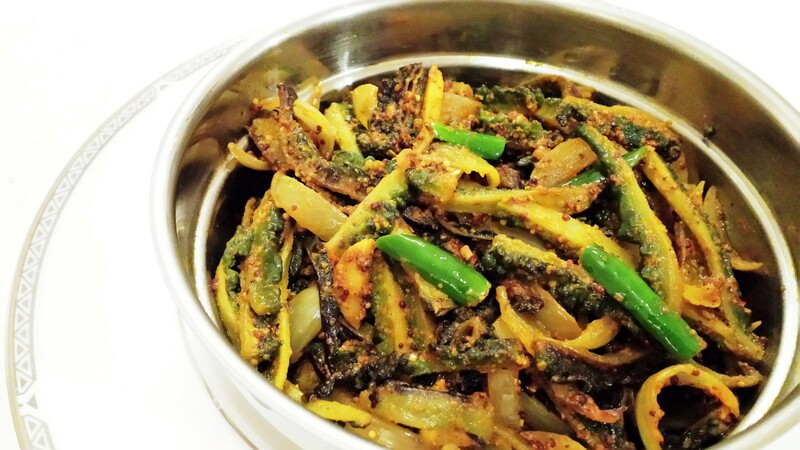 Fry until tender, do not overcook the Karela, since you want them to remain some crunch with a bite. Also by not overcooking them helps to absorb the spices in the vindaye mix later. Remove the fried Karela from the frying pan and set aside. 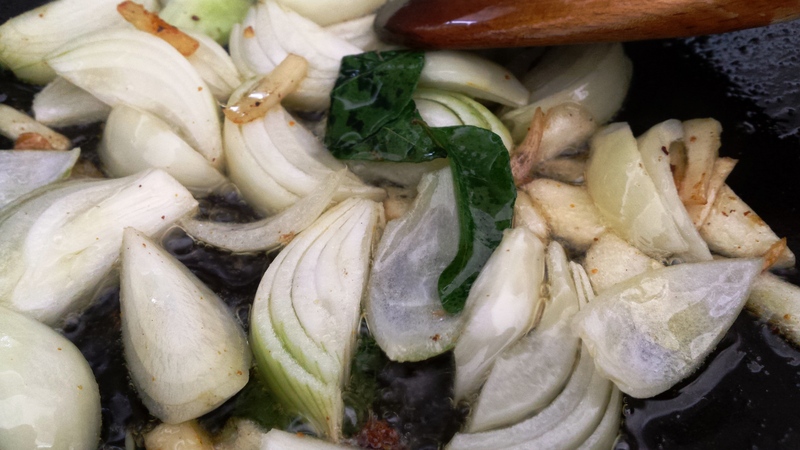 Add some of the onion in the warm oil in the same frying pan you fried the vegetable. (If you find that when frying the Karela most of the oil has been consumed, add few more tablespoon of vegetable oil.) Cook the onion until slightly translucent over a medium heat. Do not fry the onion, as you want them to remain crunchy. Add the garlic, methi seeds and curry leaves. Using a small mixing bowl add the mustard seeds, turmeric powder, salt and mix well with some cold water to make a paste. Add the mustard mixture to the onion in the pan. Cook on medium heat for 3mins. Taking care not to overcook the mustard mixture (overcooked mustard and methi seeds can taste bitter). Add the fried Karela to the pan; toss gently until the vegetable is well coated with the vindaye mixture. 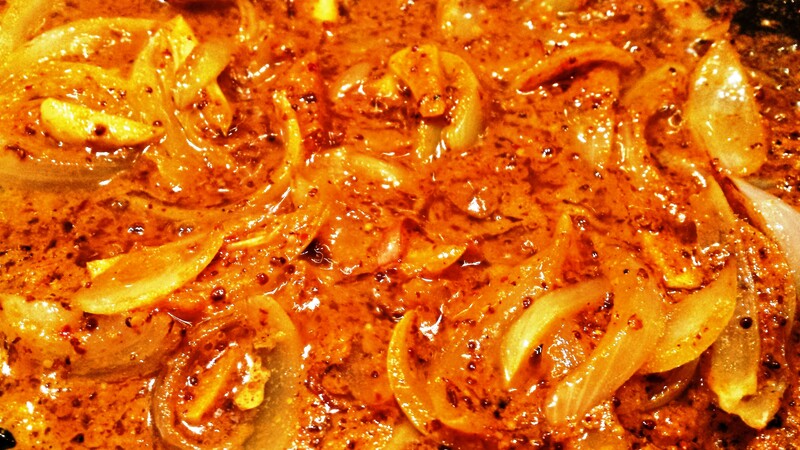 Remove from the heat and add the remaining onion. Pour over the vinegar, give the mixture a good drizzle of oil and add the sliced green chillies. Allow to cool, cover and leave to pickle in the fridge overnight. This Vindaye will keep for a few days if stored in the refrigerator. Brinda’s Notes & Serving Suggestions: Enjoy with fresh bread, or wrapped in pharata or roti. Karela Vindaye makes a great side dish, accompanied with dholl or lentils and rice, a mouth watering vegetarian meal.